Avast, ye landlubbers!!! Don't just set the dinner table, set sail with these cool new Sailboat Napkin Holders. 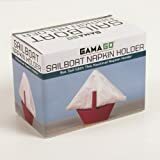 These nautical napkin holders transform your boring old square napkins into mighty sails with just a simple fold. If you stare at these too long, daydreams about swashbuckling adventures all across the high seas or sailing peacefully around the world are inevitable, especially when the rest of the family drones on and on about something, so pay attention or you'll be swabbin' the deck in no time. Available in red or black.